The time for Crystal Ball 2015 is almost here. During the week of January 12 we will need volunteers at The Arena of Southaven during the day and then on the night of the ball. Can you come and help? Tuesday, January 13 - Friday, January 16 9:00AM - 7:00 PM Can you come in the morning, afternoon, or evening? 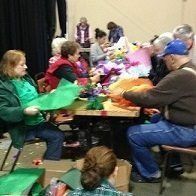 Volunteers needed to work on turning the Arena into Wonderland. The process continues with constructing Wonderland. We will be moving closer to Wonderland. You will be amazed......Wonderland is almost here. Some volunteers will be needed before the Ball and some during depending on your assigned task. Log in to see who is volunteering for Crystal Ball 2015 Is Calling Your Name!